Republican presidential candidate Marco Rubio at the First in the Nation Republican Leadership Summit on April 17 in Nashua, New Hampshire. For the first time since the 2014 midterm elections, Rubio is leading the 2016 GOP field, according to polls by Fox News and Quinnipiac University. Rubio is a serious contender for the Republican nomination, but he is only the latest candidate to receive a polling boost from a burst of favorable press. And he likely won’t be the last. In a race so tight, the most important thing to pay attention to continues to be the underlying fundamentals of the race: Is the candidate liked? Is she building a campaign infrastructure? Does she hold positions amenable to voters? And so on. Those look good for Rubio. Take a look at this local regression chart of the top five candidates in the national Republican primary polls since the midterms. Jeb Bush climbed during December, which is when he announced that he was actively exploring a run for president. Scott Walker saw a more rapid rise during January, when he gave a very well-received speech at the Iowa Freedom Summit. Ted Cruz, who isn’t likely to actually contend for the nomination, rocketed up when he announced for president in March. 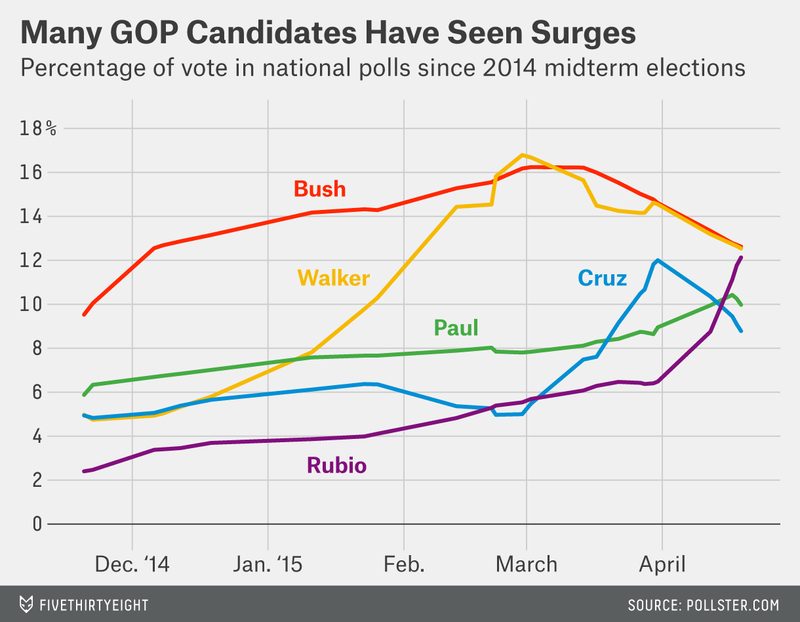 Even Rand Paul, who was fairly well-known before his campaign launch in April, rose in the past month. The fact that all these candidates have surged and then dropped (or begun to drop) again and that no one is consistently polling above 15 percent shows how unsettled the GOP field is — not surprising such a long way from the actual voting. 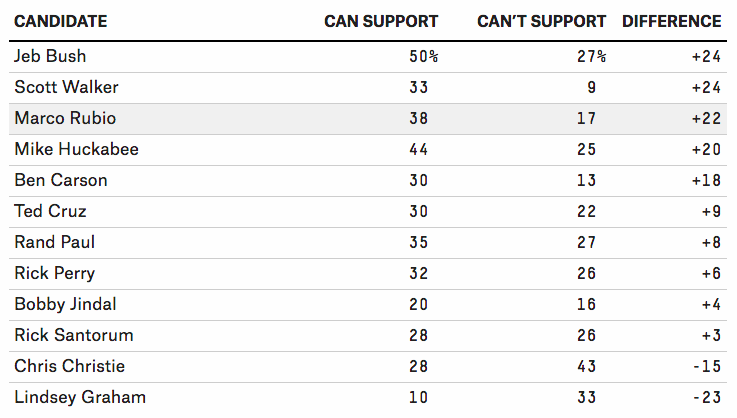 What makes Rubio strong isn’t his polling surge, but that he is well-liked across the party apparatus. He pulls in conservatives with his voting record and moderates with his impressive 2010 Senate victory in Florida, a crucial battleground state. 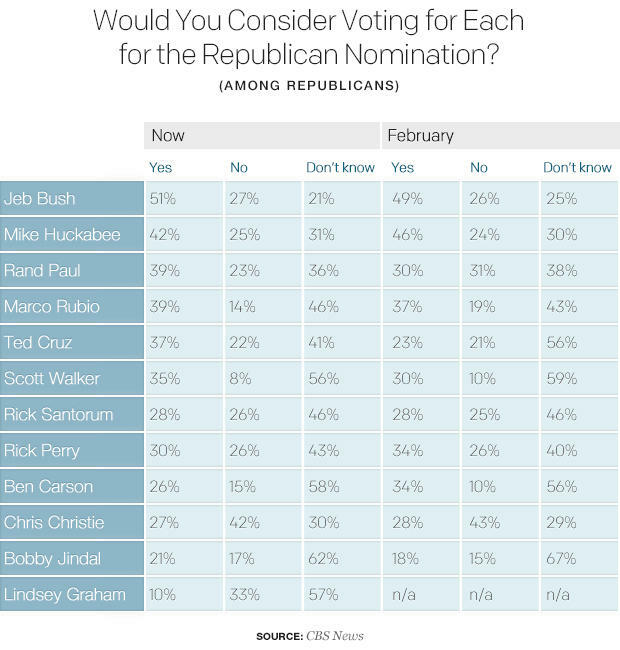 Rubio’s current polling uptick may or may not last. But few other candidates look as strong in the underlying data that will ultimately dictate the direction that the 2016 Republican primary takes.